Often we buy knife sets and only use the one or two we are comfortable with – sometimes we are unsure of the correct uses for all the others. This list covers all the basic home kitchen knives. A meat Cleaver is a large, rectangular knife that is used for splitting or “cleaving” meat and bone. The edge is sharply bevelled and the bevel is typically convex. The knife is designed to cut with a swift stroke. The cleaver most often found in a home knife set is a light-duty cleaver about 15cm long. A Bread knife is a serrated knife that is on average 20cm in length. The serrations on the blade make it ideal for cutting bread and other foods with a hard surface and soft interior. A Boning knife is used to remove bones from cuts of meat. It has a thin, often flexible blade, usually about 12cm to 15cm long that allows it to get into small spaces. A stiff knife is good for beef and pork, but a flexible boning knife is preferred for poultry and fish. A Chef’s knife also known as a cook’s knife or French knife is an all-purpose knife that is curved to allow the cook to rock the knife on the cutting board for a more precise cut. 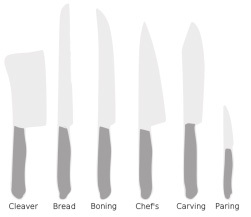 Chef’s knives are mostly between 15cm and 30cm, with 20cm being the most common size. A Carving knife is a large knife between 20cm and 38cm that is used to slice thin precise cuts of meat, poultry, roasts, hams and other large cooked meats. A Paring knife is a small knife with a plain edge blade that is ideal for peeling and other small or intricate work such as de-veining shrimp, removing seeds from chillies, or cutting small garnishes. It is designed to be an all-purpose knife, similar to a Chef’s knife, except much smaller. Parking knives are usually between 6cm and 10cm long.